Professional for journeys - with display weakness. Presumably designing a really good subnotebook is one of the most challenging tasks of mobile notebook development. It is essential to design a robust and light notebook which faces at the same time sufficient power and good battery runtime. 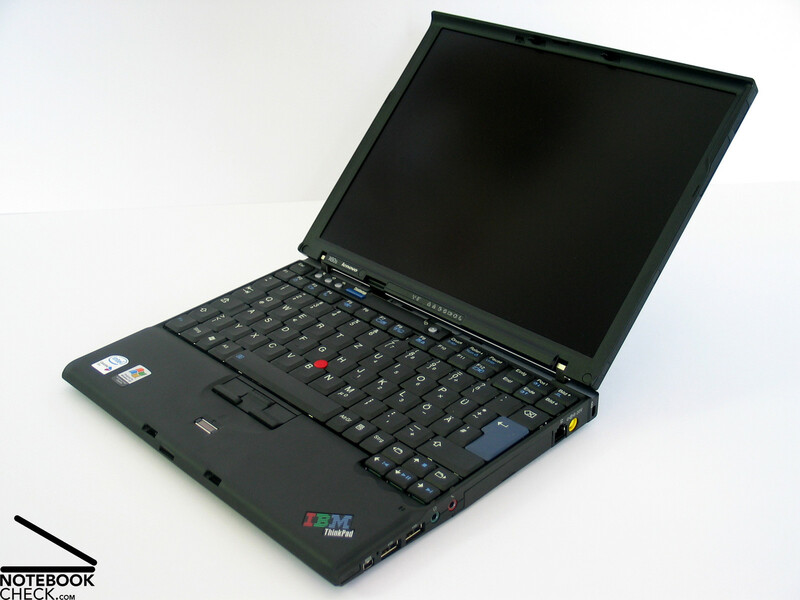 Lenovo's preconditions are good, because of the recently acquired, first-class knowledge of IBM. 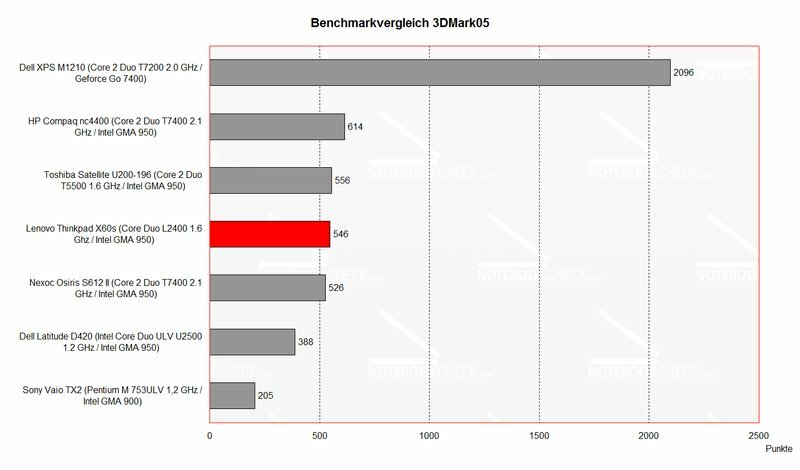 As usual you can read about the Thinkpad X60s' capabilities at notebookcheck.net. 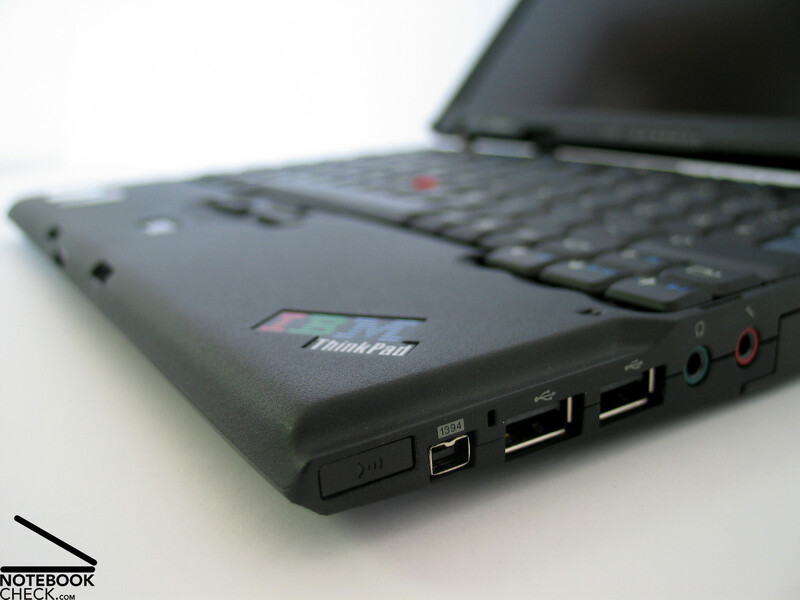 The design of Thinkpad X60s is typical business-like without any striking highlights. So to speak, every design detail gets its right to exist directly from its technical and functional use. The only apparent highlight is the bright red track point in the center of a jet-black keyboard. 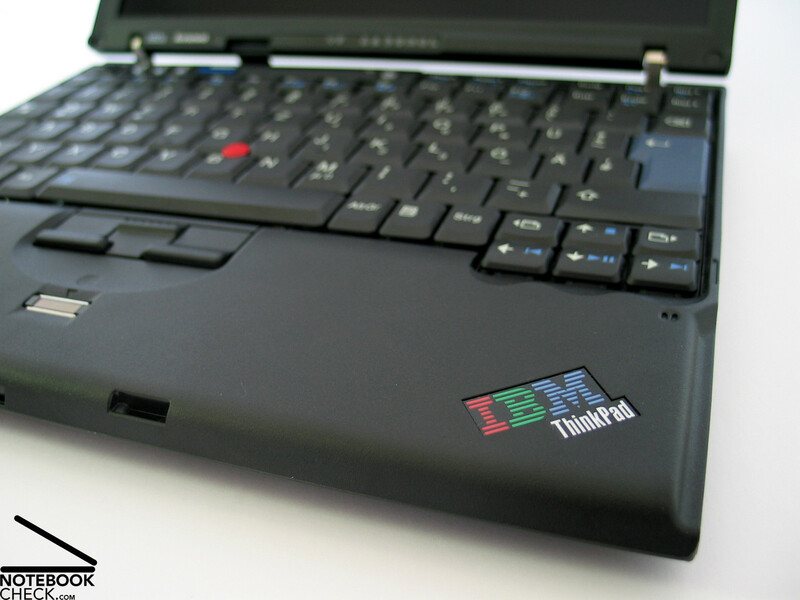 So, there is no doubt that this is the Thinkpad's trademark. Also the well-known IBM Logo is present - at the palm rest areas and at the display cover - still something people next to you might envy you. The X60s' case is mainly out of a high-quality magnesium alloy. The inner construction, the bottom side of the case jacket, and the display cover are made out of this material, which has excellent weight and stability properties. But, these magnesium parts do not only contribute to the robustness of the notebook. Also their haptics is wonderful. Touching this notebook feels comfortable, nearly velvety. A small disadvantage: It's more difficult to clean. The palm rest areas are made of plastics, but they also have a high-quality surface. In total the Thinkpad X60s reaches a noteworthy robustness and flexural rigidity. Although the height is only slightly more than one centimeter, the X60s convinces by an excellent flexural rigidity and pressure resistance. Looking for creaking noises is also in vain. The flexural rigidity of the display is equally good. The magnesium cover in combination with the well proven Camshell design do a good job. Still, you can observe slight deformations in the center of the display, if you apply forces. So, you should not trifle with this 1.3 kg mite of hardly A4 size. 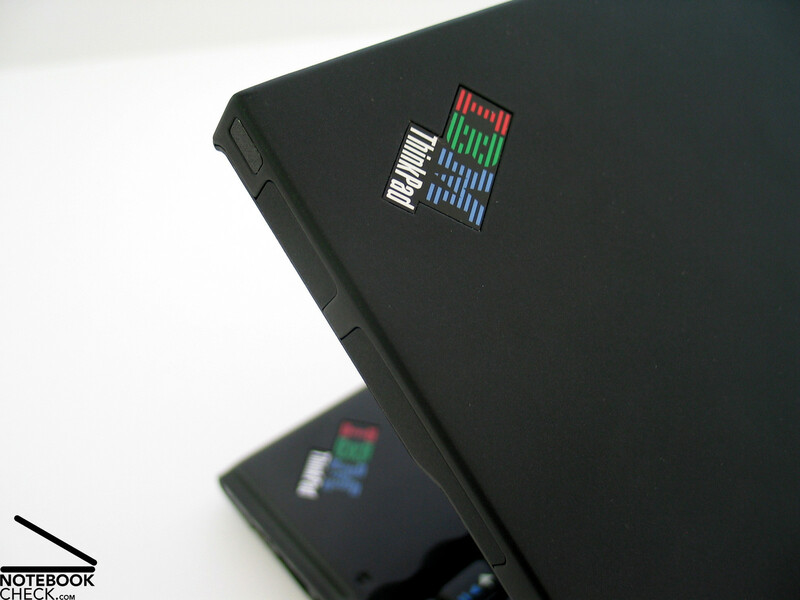 The display hinges are designed typical IBM. Although they are rather small in comparison, no other flap mechanism is likely to equal it. 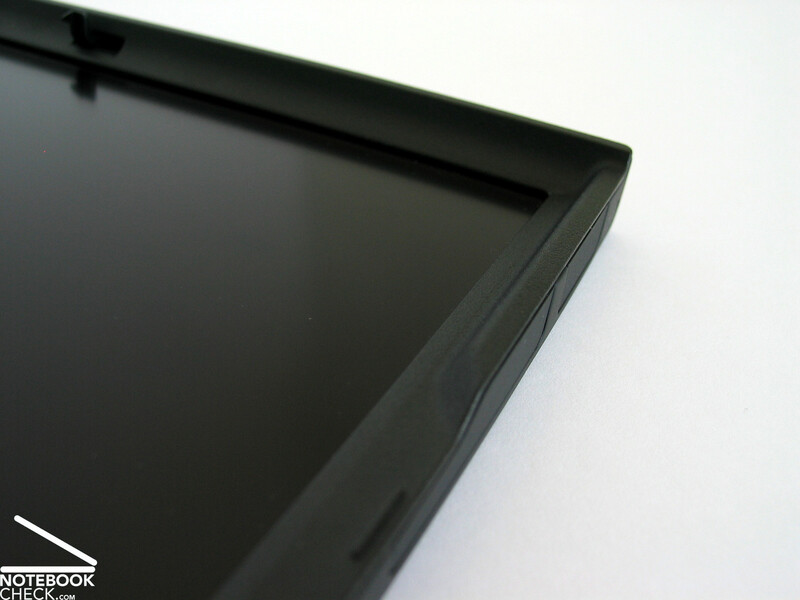 Two robust metal spikes hold the 12 inch display absolutely tight, without any see-saw. Still, the display can be positioned without applying force. 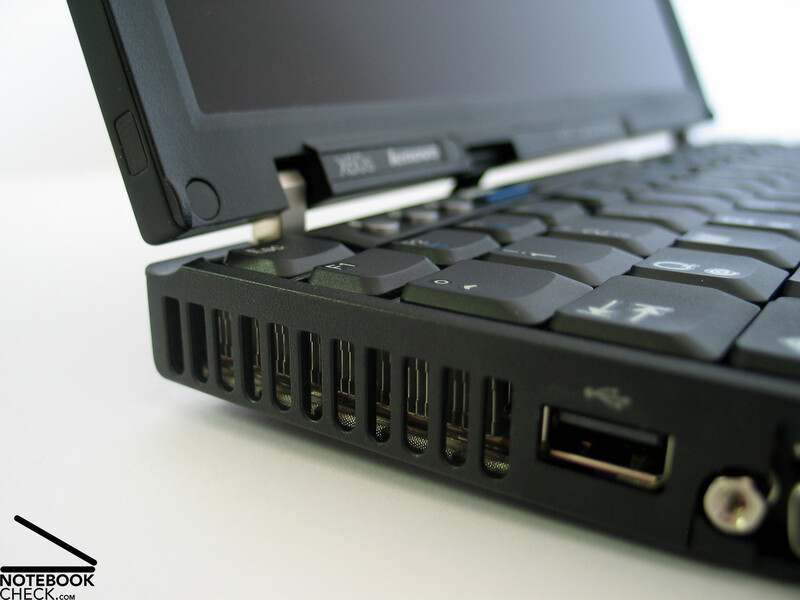 A ramshorn hook ensures that the display is securely locked: The case of the X60s is designed in a way that the display and the case so to speak fold together. So, the horizontal forces on the hinges are reduced and at the same time the display is protected against dust and object penetration. 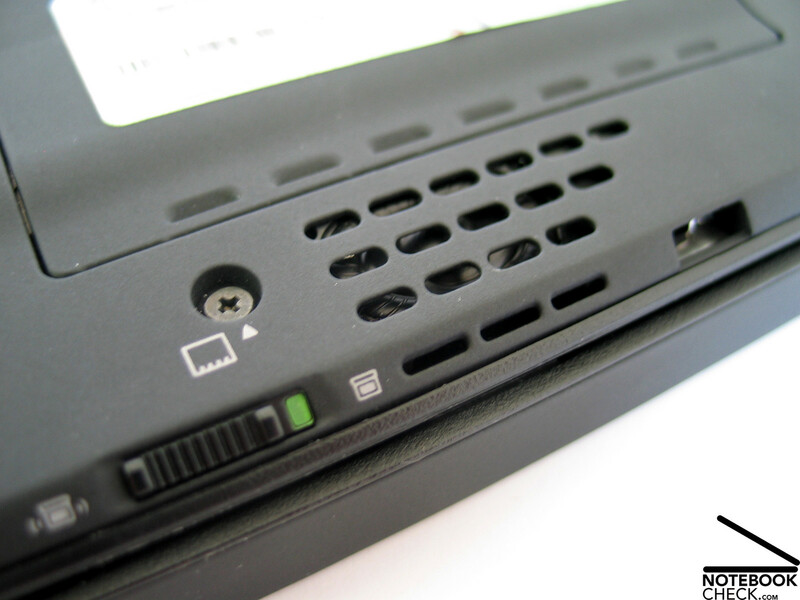 The ports of the X60s are on both sides, because the back side is used for the battery. The provided ports are so to call a base equipment for subnotebooks. These are USB 2.0 ports, Firewire and VGA port. Of course it is possible to enhance the variety and number of ports by attaching the notebook to a docking station via the provided docking port. 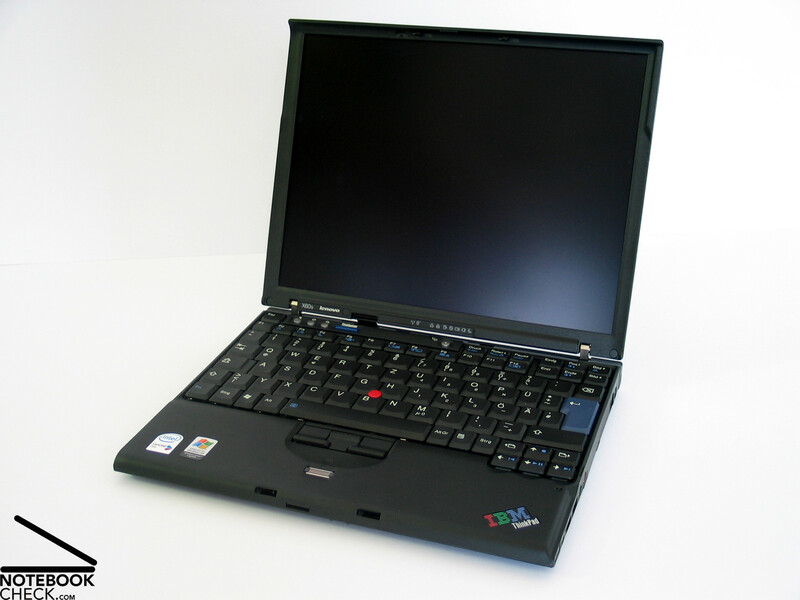 Furthermore, the X60s does not have an integrated optical drive. Whereas most subnotebooks are mean with input devices, these are a special strengths of the Thinkpad X60s. The width as well as the length of the base unit are optimally used by the keyboard unit. So, it provides optimal overview and comfort at smallest available space. The size of the keys are in general reasonable, only right beside the enter key, which extends over two rows, the space is rather narrow. 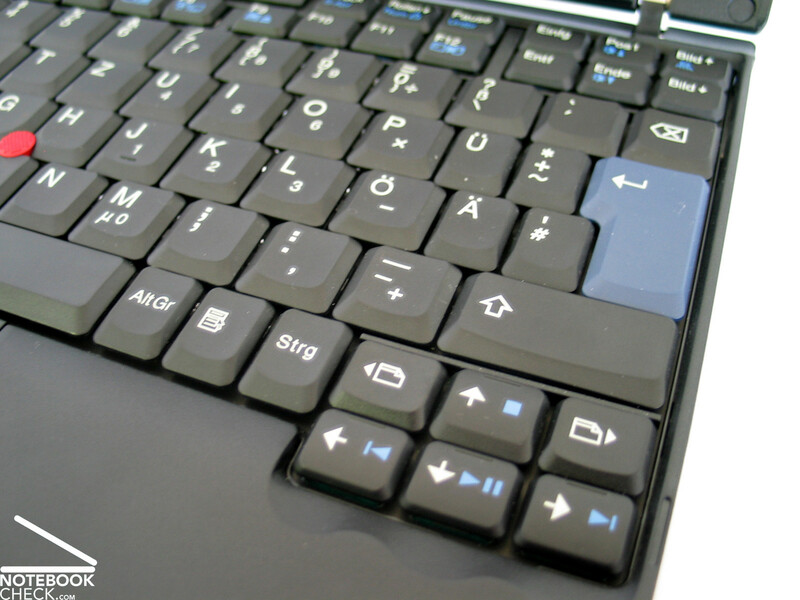 The keys which are reserved for "ü, ä, +, and #" in the German keyboard layout were shrunk to about 2/3 of standard size. The same happened to the Windows, the Alt, and the Ctrl key in the front row. Despite these losses the keyboard is first-class although you might need some practice to avoid typing mistakes. As usual the keyboard is tightly attached to the case, typing feels wonderful: the travel is sufficient and there is a clear pressure point. Some further properties of the keyboard are noteworthy. 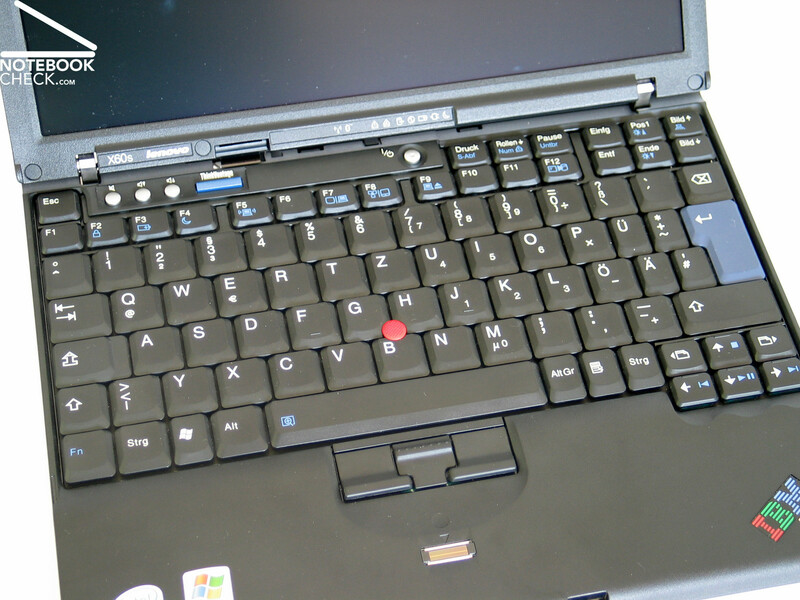 The Thinkpad layout places the FN key is totally at the left border. Compared to other notebooks it changed the place with the Ctrl key. Furthermore, a hot-key called "ThinkVantage" is provided, which allows direct access to the software tool package of IBM/Lenovo. This package allows to quickly and easily change the hardware and the software configuration by an easily understandable user guidance. A nice gadget is also the Thinklight, a white LED, which illuminates the keyboard from the upper display edge without bedazzling the user. 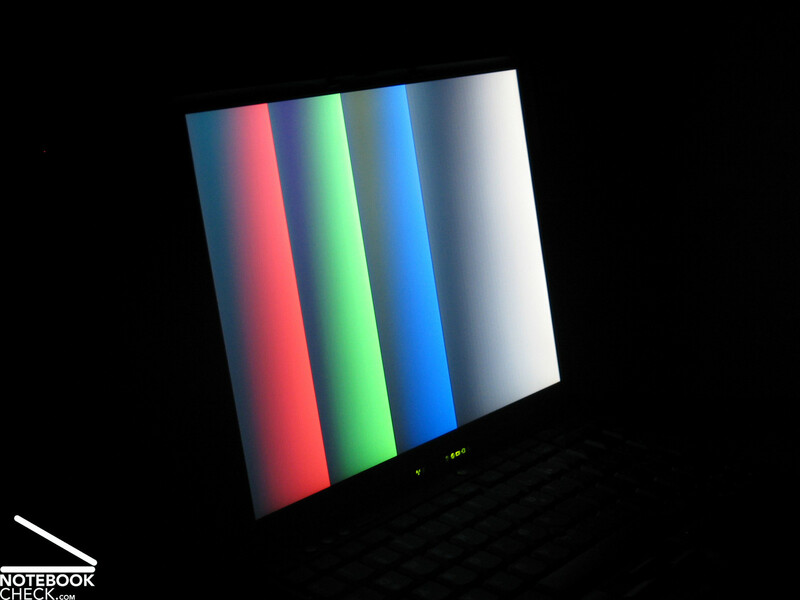 So, it is possible to work with this notebook even if it is nearly completely dark, although the brightness of the display is not sufficient to also illuminate the keyboard, but we'll talk about this aspect later. Another property of the X60s is that it misses out the otherwise usual touch pad. 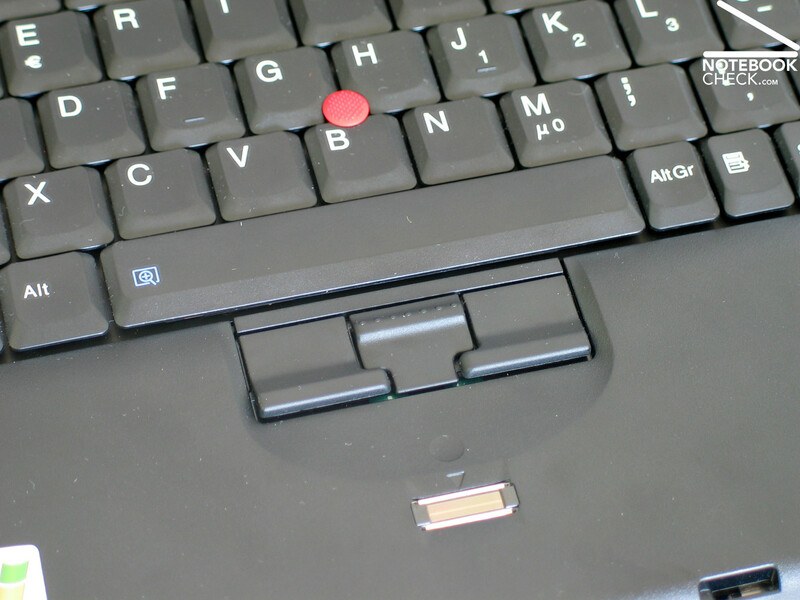 Because of problems due to only restricted space, and because of a design decision for a more spacious keyboard, the pad was missed out and the notebook was only equipped with a track point, which demands clearly less space. This small red device, which most users are unaccustomed to and which likely taxes the users' patience at the first, soon turns out to be the better mouse replacement. 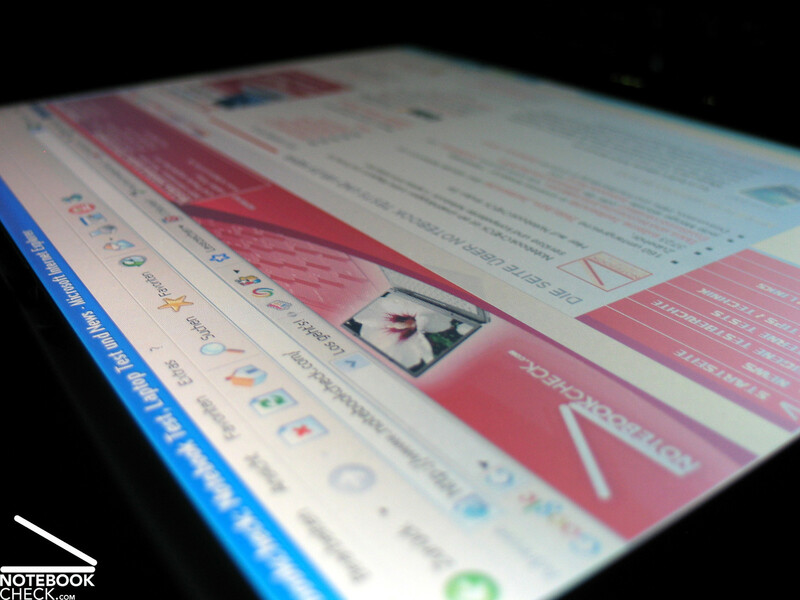 It is not necessary to move the finger in order to reach certain regions of the display, and the mouse pointer can be controlled by a relaxed and still hand. The force controls the speed at which the mouse pointer moves, the direction of the force the directions of the movement. Should this Thinkpad trademark still cause problems - you can still attach a mouse to one of the three USB ports, up-to-date optical mice work without problems at nearly all surfaces, no matter, if it is a polished metal table, or the cord off the comfortable sofa in the living room. 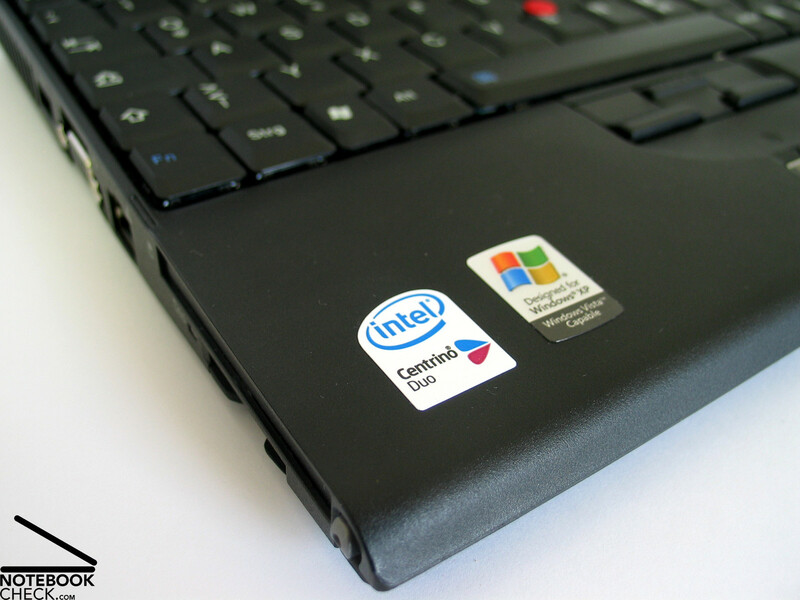 Another word regarding data security: The Thinkpad X60s is equipped with a fingerprint reader and can therefore, be protected against unauthorized use. 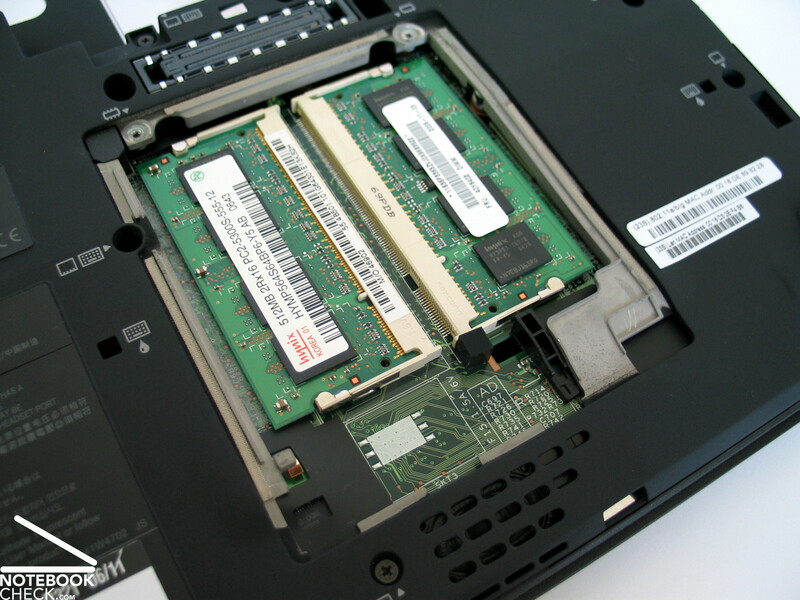 Furthermore, the X60s uses the well-known active hard disk protection, which removes the head of the hard disk within seconds upon jerks in order to avoid data loss. Software for data backup, TPM chip, and a possible Bios password can help you to further protect your confidential data. 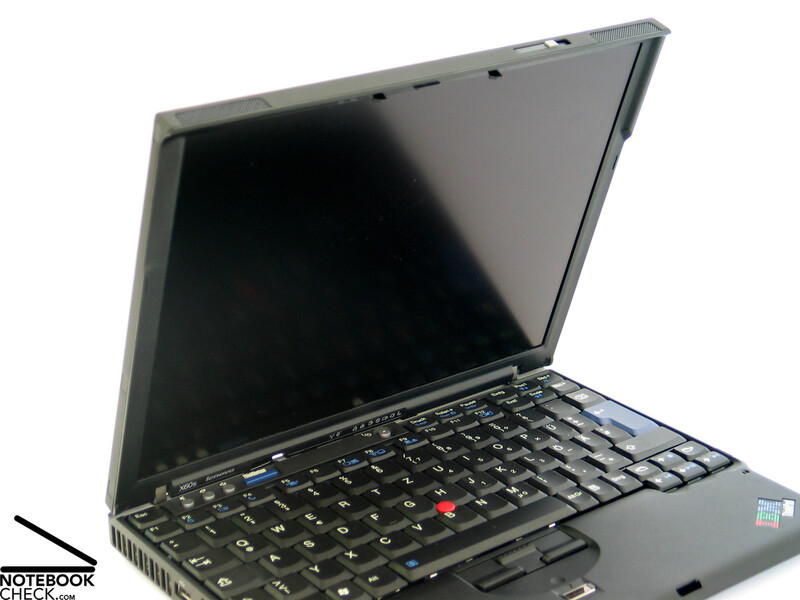 Comprehensive details about security provided by the X60s are available at the product web site. The Thinkpad X60s is equipped with a non-reflecting 12 inch XGA display with a maximum resolution of 1024x768 pixels. So, the area of operation on the display is compared to other 12 inch notebooks with WXGA display clearly limited. Unfortunately, Lenovo does currently not even offer any alternative configuration with higher resolution. The maximum brightness of the panel was only 124.8 cd/m². The average value of only 114.8 cd/m² is even lower. Despite this, the illumination is very good at 86.4%. Anyway, the brightness is sufficient for indoor use. However, outdoor use might cause problems, but we'll talk about this aspect later. 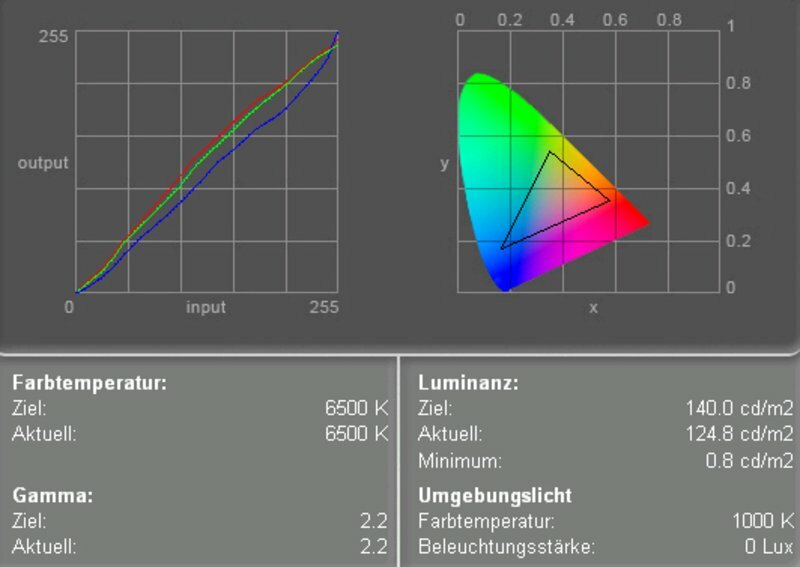 The display diagram depicts a slightly lowered blue color curve, which results in warmer colors. In total the colors are not really bright. 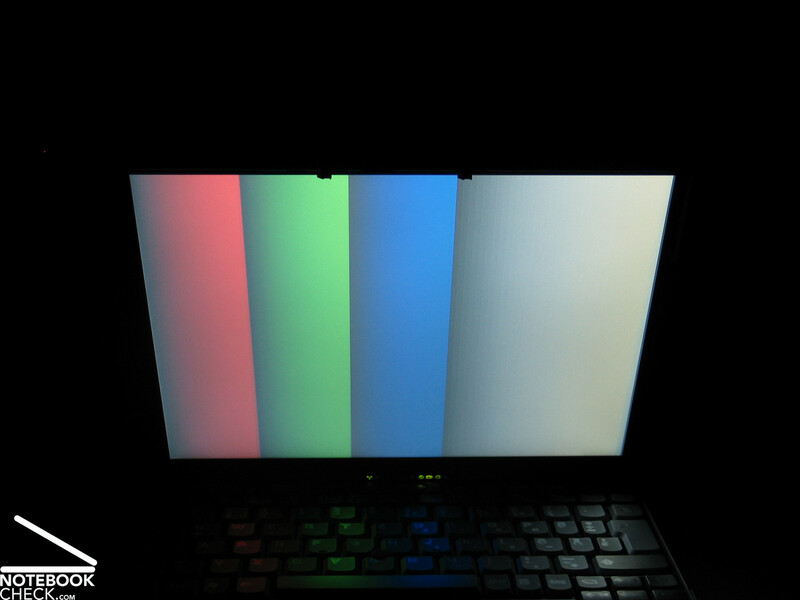 This impression is also supported by the calculated contrast ratio of this display. A black value of 0.8 cd/m² together with a low maximum brightness give a calculated contrast ratio of only 156:1, a rather poor result. Even during normal use, you'll recognize that this display's speed of reaction is not one of the fastest. Animations and fast scrolling lead to a blurring of the displayed images. All these aspects get even more transparent at outdoor usage than in normal illuminated indoor rooms. 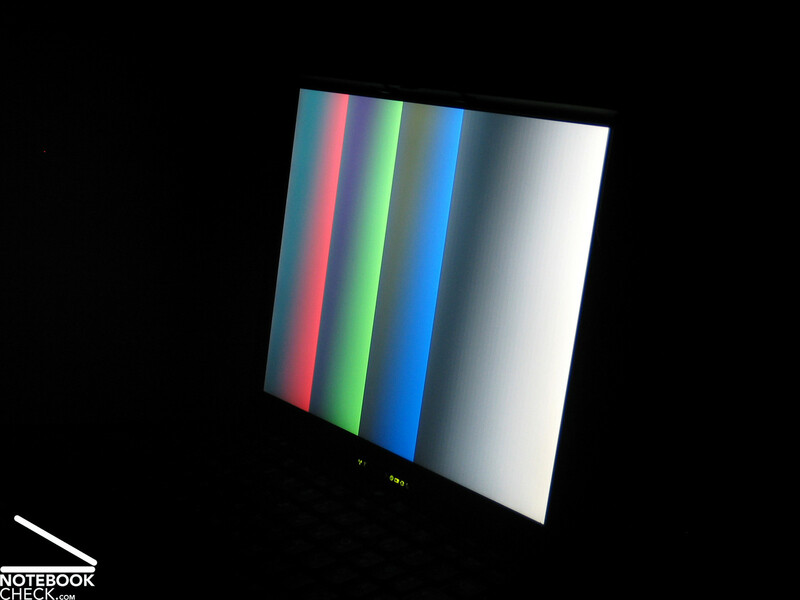 In very bright environments the display appears to be very dark and subjectively the contrast diminishes even more. A further aspect for the bad results at outdoor usage is the brightness control of this display, which reduces the brightness of the display in battery mode even more and only allows a maximum brightness of just under 80 cd/m². You can turn off this behavior in the settings, however, even at maximum brightness the possibility of working in the sunshine is only limited. 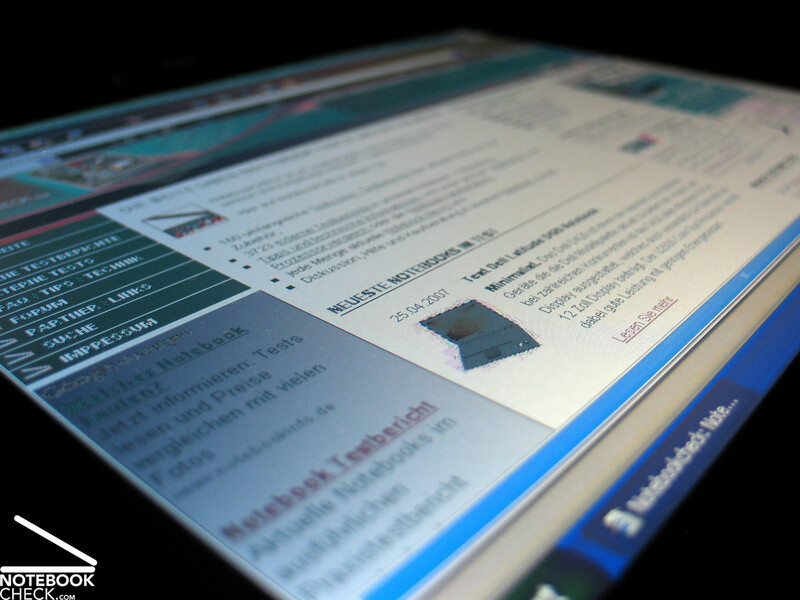 The last aspect considered regarding quality of a display is its stability to the vantage point. 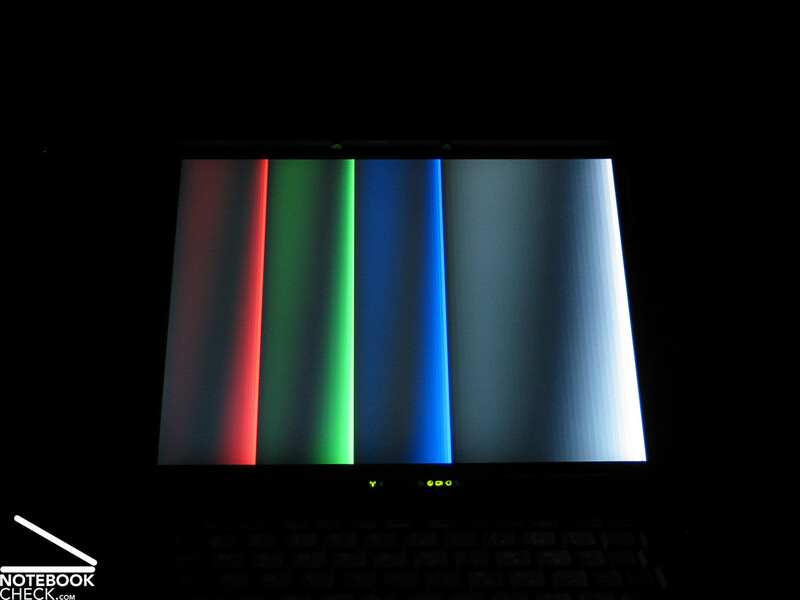 Regarding this aspect the Thinkpad X60s' display has horizontally a sufficient area of operation, but the contrast diminishes at very acute angles. Vertically, the area of operation is very narrow, even slight deviations to the top or to the bottom lead to a heavy darkening or whitening of the displayed image. Similar to other Thinkpads, also the X60s is offered in a variety of different configurations and therewith also of different performance. 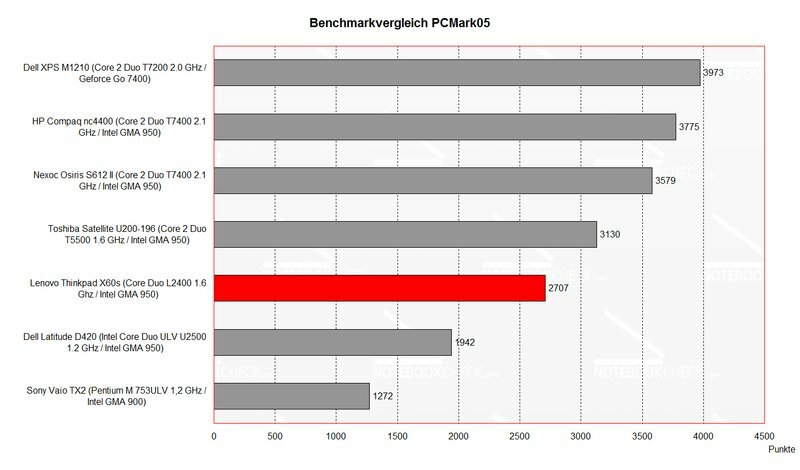 Regarding processor a number of energy saving versions of Pentium M, Core Duo, and Core 2 Duo CPUs, as well as powerful chips up to a Core 2 Duo T7200 CPU with 2.0 Ghz are offered. The choice of the processor depends on the demanded performance and on the demands regarding emissions and battery runtime. As a rule of thumb: The more performance, the more emissions and the lower the battery runtime. 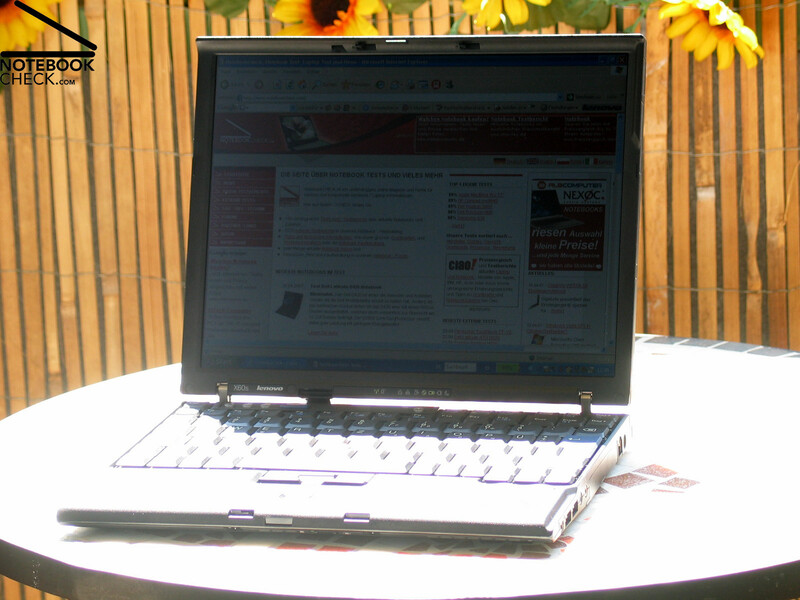 The notebook we reviewed was equipped with a L2400 CPU, the energy saving version of the Intel Core Duo T2300 processor. This is a good trade-off between performance and energy demand and provides the X60s with good and sufficient office performance. The integrated Intel GMA 950 video chip is responsible for graphics. This provides a sufficient performance for office and internet applications, but its use for higher 3D demands is rather limited. Anyway, in total this notebook aims at office operation. It should also be possible to upgrade to Windows Vista later on, even if the higher memory demands of Vista will likely reduce the performance of this notebook. The main memory can be easily upgraded to a maximum capacity of 4GB, however, we want to mention, that the current configuration allocates both of the easily accessible memory slots with 512MB banks. So a upgrade requires replacing at least one of them. The 80GB Toshiba hard disk rated average regarding transfer rates and access times. Alternatively you can currently choose models with up to 120 GB capacity. In idle mode the noise of the fan is moderate and not really disturbing. Interestingly, the fan hardly runs without load and is very quiet under load, so that the noise of the hard disk was clearly louder than the fan. The total noise level of the X60s is between 35.4 and 38.4 dB, which is moderate and well acceptable. 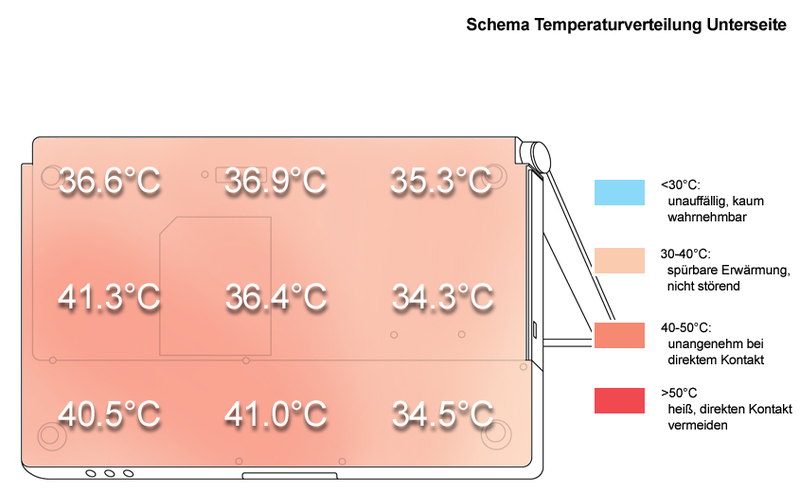 The case, which is mainly made out of magnesium, is obviously also used for passive cooling. 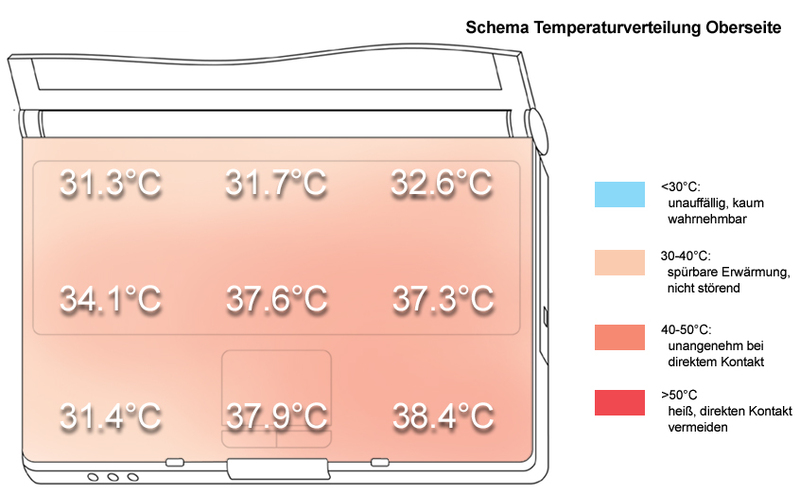 The upper side as well as the bottom side of this notebook got only moderately warmer and reached maximum temperatures of about 40°C. So, this notebook is fit for mobile use regarding this aspect, although the performance during mobile use is likely to be reduced, because of a limited battery runtime. A single speaker in the center of the front edge is responsible for sound, which is to some degree acceptable. The maximum volume is rather limited and the sonority suffers from blatant lack of basses. In total we would recommend the use of headphones for listening to music. 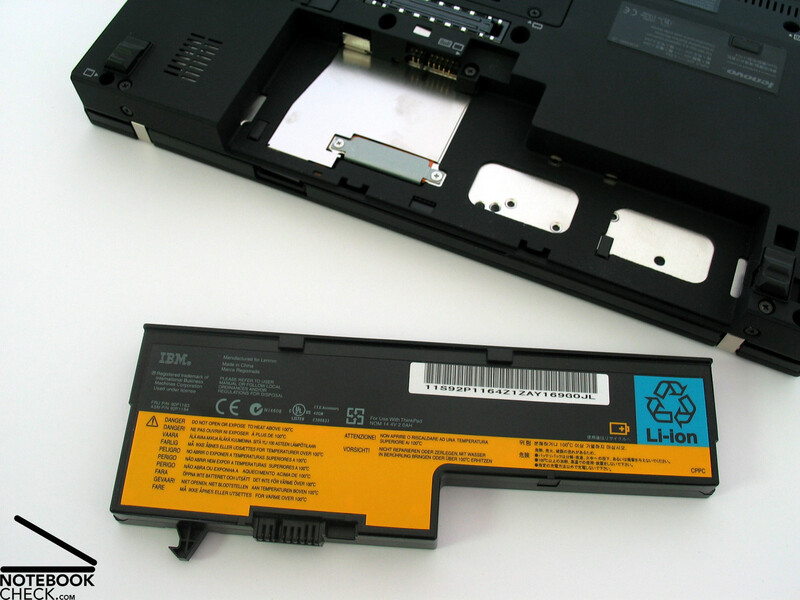 The reviewed X60s was equipped with a small, especially light 2000 mAh battery (Slim Line Battery). Alternatively, a somewhat bigger 4 cell version (Enhanced Capacity Battery) which slightly protrudes the case, and a 8 cell battery, which protrudes or docks over the total width, are available. The weight of the battery is a half kilogram, which is nearly as much as the weight of the half notebook. Be that as it may, at least there are some alternatives available, which can be used to clearly increase the default battery's somewhat poor battery runtime, which is in between a minimum of about 1 hour and a maximum of about 3.5 hours. 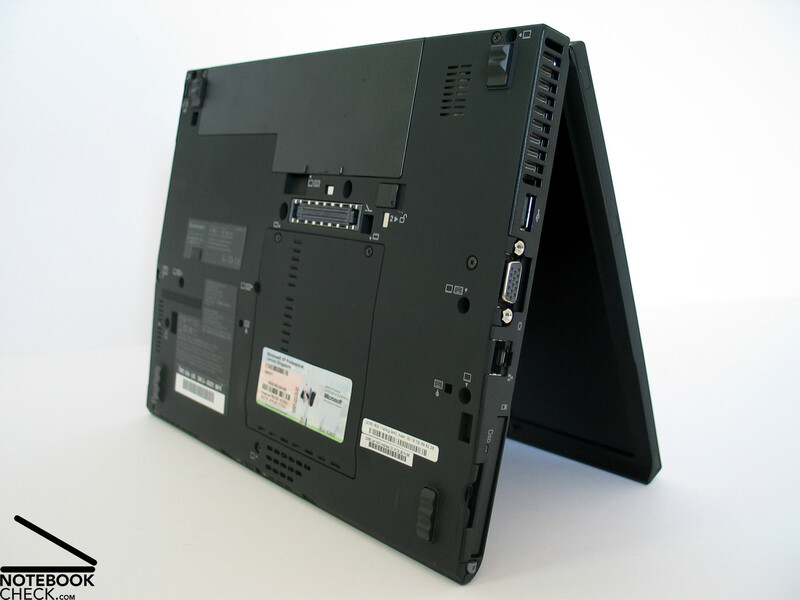 The Lenovo Thinkpad X60s is a high-quality notebook of excellent workmanship in successful IBM design. Although the design won't win prices the Thinkpad's style is a class of its own regarding ergonomics and functional design. Also the input devices could totally convince. The track point is the only mouse replacement, so, if you are not used to it, you might need some time to get familiar with it, but afterwards you will appreciate it. 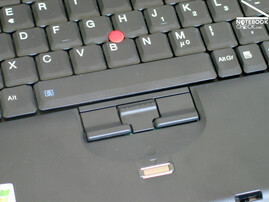 Thinkpad's keyboard qualities regarding overview and typing comfort are well-known and so are the X60s', even, if the keyboard had to be somewhat smaller. 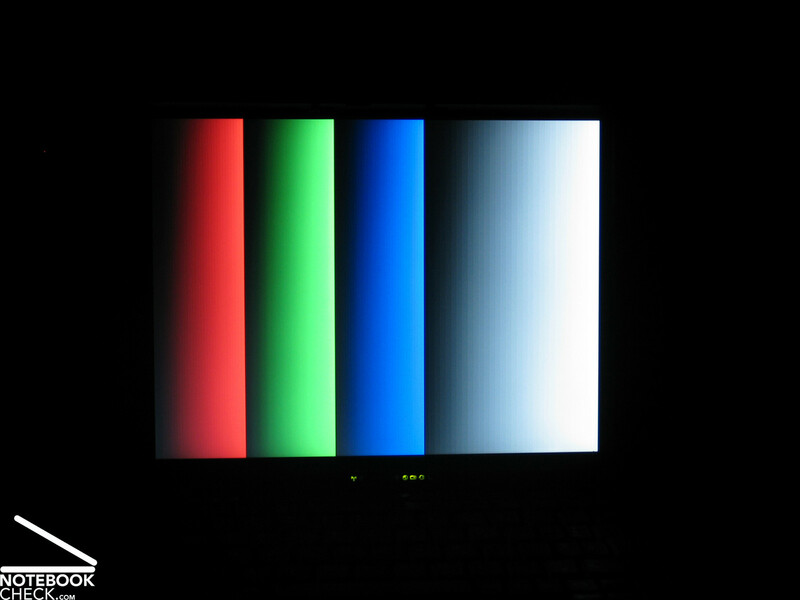 The display is only moderately bright, but, well illuminated, and its contrast is low. In average bright environments this should not cause any problems, but especially in mobile use with rapidly changing environments the use of this display can be rather limited. 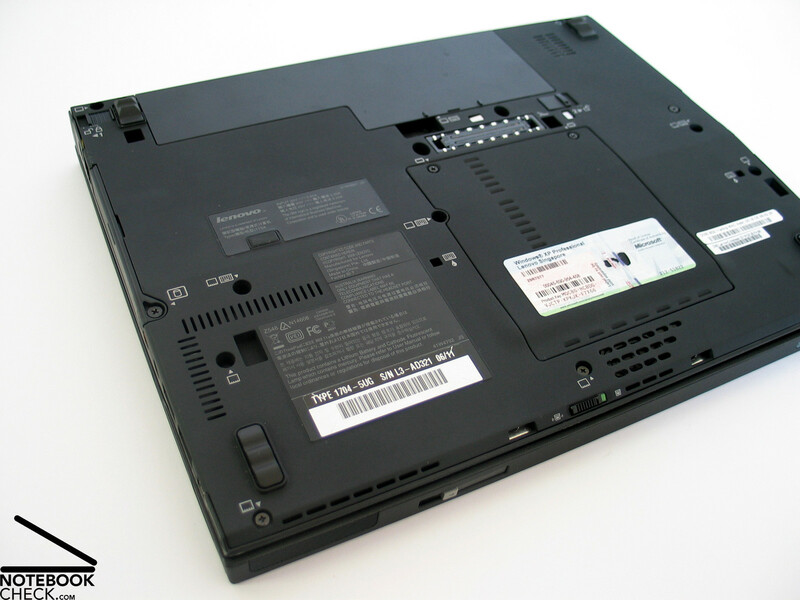 The performance of the reviewed notebook is a successful trade-off between mobility and performance. The X60s' power is sufficient for daily office applications and also the emissions of the notebook are alright. The battery runtime is in between nearly one hour and a maximum of 3 hours, which is not really outstanding, but, it can be increased by a variety of alternative batteries. However, these batteries also increase the Thinkpad X60s' otherwise low weight of only 1.3kg with base equipment. Not outstanding, but alright: Thinkpad X60s' speakers. In practice the surface temperatures of this notebook are alright. The noise of the fan is alright, the noise of the hard disk is clearly more disturbing. The Core Duo L2400 processor provides sufficient power at low energy demand. Especially the brightness and the contrast should be definitely better. The low XGA resolution is not the only weakness of the display. Successful Thinkpad qualities, but, of course in smaller dimensions: X60s' keyboard. 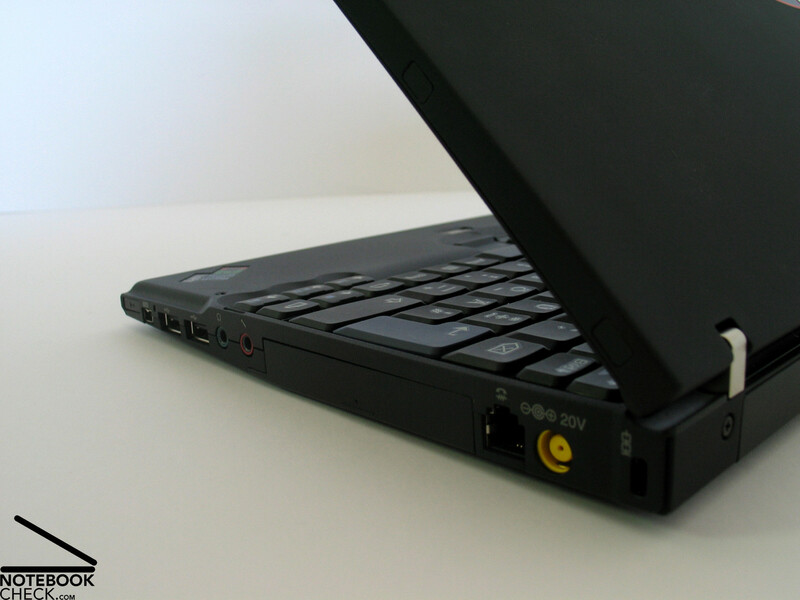 Basic ports are available at the X60s sides. 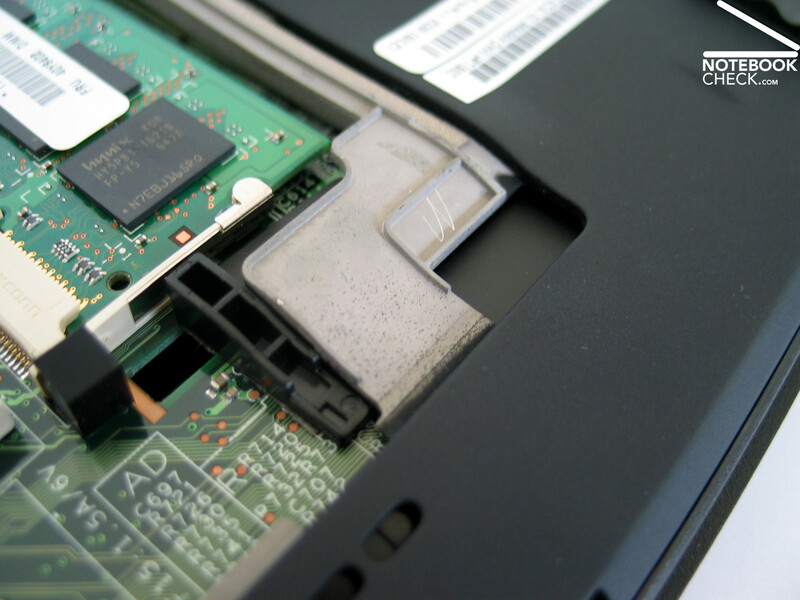 The workmanship is alright: Lenovo Thinkpad X60s. ...a robust, nearly indestructible construction, well fit for hard business work. ...and high-quality, reliable system components. ...decent, black, businesslike - without big design efforts. The battery runtime of the standard battery is by no means outstanding.